Switzerland - IOM is pleased that a number of its key recommendations to the European Union (EU) – including saving lives and sharing responsibility for asylum seekers across all member states – are part of new proposals put forward by the European Commission on Wednesday (13/5) to tackle the migration crisis in the Mediterranean. It also notes that Special Representative of the UN Secretary General for International Migration and Development Peter Sutherland has also welcomed the proposed reforms to the European asylum system outlined in the Commission’s plan. 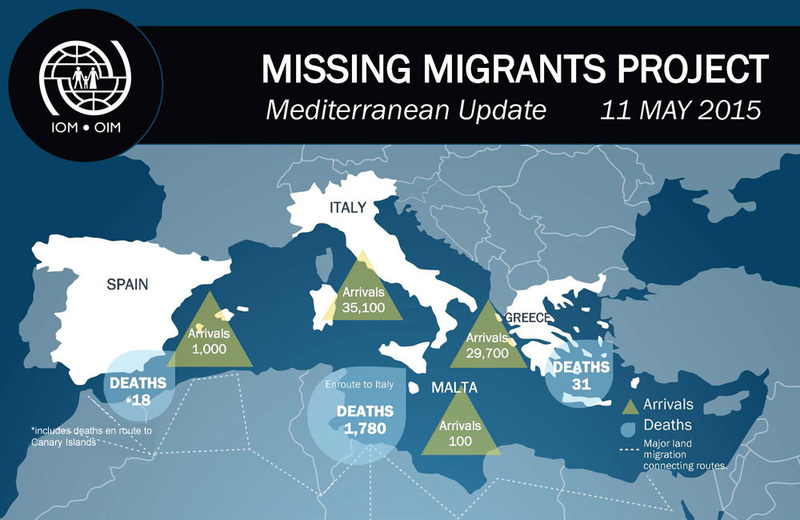 The Commission’s “European Agenda on Migration” proposes a tripling of the budget specifically for life-saving missions throughout the Mediterranean, where at least 1,826 migrants have perished so far this year. It also proposes a more equitable sharing of resettlement responsibilities throughout the EU. The proposed changes hold out the promise of safer legal migration avenues and improved access to international protection. “These initiatives reflect serious and constructive approaches to a challenge which IOM expects to continue,” said IOM Director General William Lacy Swing. Mr. Sutherland also commended the plan. “I expect that the resettlement target of 20,000 will increase over time and that the EU will continue to expand safe avenues by providing more humanitarian, labour, and family reunification visas to asylum seekers and migrants,” he said. IOM particularly welcomes the Commission's renewed focus on life saving. The proposals are “initial steps in addressing the humanitarian plight of tens of thousands of migrants and refugees who put their lives in the hands of unscrupulous smugglers in unseaworthy vessels, in order to cross the Mediterranean,” said Ambassador Swing. “We strongly support the EU recommendation to prioritize saving migrant lives at sea by expanding current border patrol operations (such as Triton) to the level and scale of the life-saving Mare Nostrum operation, which was phased out last year,” he added. The proposed tripling of Triton’s budget will expand the current area of operations beyond the existing 30-mile limit to the most perilous migrant-smuggling routes and will help to save lives of migrants on the high seas. IOM also supports the renewed focus on disrupting criminal smuggling networks, but has serious concerns about proposals to “systematically identify, capture and destroy vessels used by smugglers,” through EU Common Security and Defense (CSDP) operations. While recognizing the need for a powerful demonstration of the EU’s determination to act, IOM sees inherent risk that military actions, however laudable, could further endanger migrant lives. IOM also welcomes the plans to engage with migrants long before they reach the Mediterranean and to support countries bearing the brunt of those displaced by conflict and human rights abuses. Niger, for example, is a key transit point for migrants heading to Europe. The Commission plan is for IOM and UNHCR to create “a pilot multi-purpose centre” in the country. This would provide information on the perils ahead, protection from exploitation and identify those in need of resettlement, temporary protection, family reunification and other options. IOM stands ready to contribute to the development of sound migration policies that will create improved legal channels for people seeking work and for asylum seekers. It believes that sound labour migration policies are key to a more competitive Europe.